With crucial Assembly elections in Punjab and Uttar Pradesh due next year, the Union Cabinet today approved higher support prices for the 2011-12 Rabi season but failed to satisfy farmers who grow wheat. The Minimum Support Price (MSP) for wheat has been fixed at Rs 1,285 a quintal, Rs 165 more than what was initially fixed last year (Rs 1,120). It was a Diwali gift for banking customers as the Reserve Bank of India (RBI) announced far-reaching changes for retail banking by deregulating savings account interest rates, abolished penalty on prepayment of home loans but this was tempered by a bad news in the form of another hike in interest rates by 25 basis but signalled a pause in the rate tightening cycle. 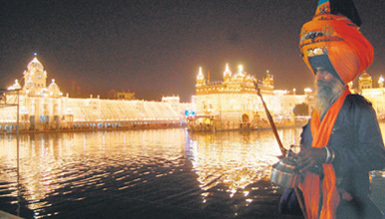 The Tribune wishes its readers a safe, happy and prosperous Diwali. Offices of The Tribune will remain closed on Wednesday. The next edition of the paper will appear on Friday, October 28. Within four days of Chief Minister Omar Abdullah announcing the decision to withdraw the Armed Forces Special Powers Act (AFSPA) from some parts of the state, militants today carried out four attacks targeting security personnel in as many hours in the Kashmir Valley, injuring three CRPF jawans and a policeman. Two days after an Army helicopter strayed into Pakistan occupied Kashmir (PoK) after crossing the Line of Control (LoC) in the Drass sector, the code names of the helipads that dot the Himalayas in Ladakh will be changed along with the calls signs of the pilots of the Army Aviation Corps operating in that militarily sensitive mountainous region. Land acquisition proceedings lapses if the government fails to make the award within the stipulated two years from the date of declaration, the Supreme Court has ruled. A Bench of Justices GS Singhvi and S J Mukhopadhaya said the time consumed by court litigations should be excluded. Rural Development Minister Jairam Ramesh today shot off a letter to Uttar Pradesh Chief Minister Mayawati asking why the CBI should not probe into the misuse of the Mahatama Gandhi National Rural Employment Guarantee Act (MGNREGA) in the state. For thousands of Tibetans living in exile here � especially those who have never been to their homeland � it will be a truly emotional moment. Starting tomorrow, they would be able to set foot on their soil.